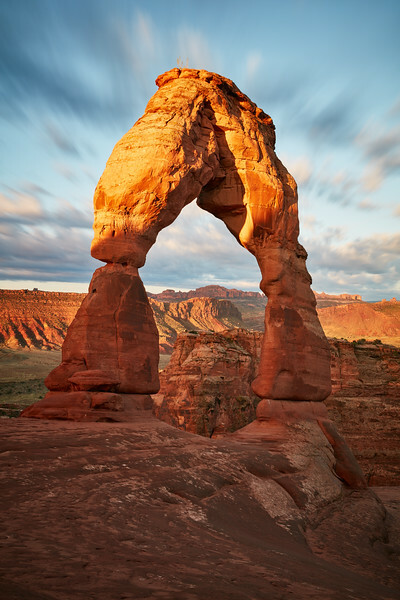 Sunset is more popular than sunrise for Delicate Arch, not only because it's easier to wake up at 5pm than 5am but also because the sunlight would lighten up the arch directly and not be blocked by the surrounding rocks on the other side. Having had a cloudy sunset the night before, I decided to return on site for sunrise and was blessed with a beautiful warm light and nice clouds in the sky. I used a 100s exposure to add some drama, making it look like clouds are come out of the arch. One must be careful when hiking in the dark though: tripping is always a risk but losing your way is even more likely. In my case, I hiked for 15 minutes till I realised the path I was following led me to a cliff with a huge drop which killed any hope of going any further. I had to hike back and follow an entirely different path (there are huge gaps between the fins and you can't really easily go from one to another), which almost made me miss the sunrise! Fortunately, as stated above, it's not the sun coming out which is the main point of interest, it's the beautiful sandstone turning vivid orange when lit up a few minutes after sunrise.